Members and supporters of the activist group CODEPINK dress in orange jumpsuits during a protest outside the National Defense University, where US President Barack Obama is scheduled to speak about his administration's counter terrorism policy, including the thorny issues of drone strikes and the future of the American prison at Guantanamo Bay, in Washington, DC. WASHINGTON (VOR) – Two members of the terrorist group al-Shabab have been killed by a U.S. military strike in Somalia. It's a sign of growing U.S. anti-terrorism efforts in the region. Earlier in October, the U.S. Navy SEALS conducted a raid in Somali to take down a Kenyan al-Shabab member. After the Iraq and Afghanistan wars, the U.S. is evolving the way it fights terrorism. Instead of boots on the ground, targeted drone strikes are becoming the preferred method. However, Dr. James Dorsey, senior fellow at the S. Rajaratnam School of International Studies, says although the U.S. prefers drone strikes because they're "cleaner" than boots on the ground, the drones present several problems. "The problem with the drone strikes is that at times civilians or people not associated with the targets are among the casualties. The second thing is it really doesn't take into account what the facts on the ground are, what tribal relationships are. So often what these strikes do is they do take out a target...but at the same time, they could aggravate tensions on the ground, and have long-term consequences. Opponents of Qatar’s foreign, sports and labor policies are striking at the Gulf state’s commercial interests in a bid to either force it to embrace reform or punish it for its support of Islamist groups. Britain’s powerful GMB trade union called this week on British construction companies active in Qatar and particularly those bidding for 2022 World Cup-related projects not to exploit cheap migrant labor that has become a focal point of controversy over the Gulf state’s hosting of the one of the world’s foremost sporting events. World soccer body FIFA was forced earlier this month to take the living and working conditions of migrant workers, who constitute a majority of Qatar’s population and 94 percent of its workforce, into consideration in its deliberations over whether to move the Cup from summer to winter because of the Gulf state’s extreme summer temperatures. In a letter to the chief executive officers of 13 British companies, GMB international officer Bert Schouwenberg requested a meeting to discuss the issue. The companies on Mr. Schouwenberg’s list included the construction manager of London's Shard skyscraper, Mace, Heathrow Terminal Five builder Laing O' Rourke, FTSE 250 group Kier, Balfour Beatty which is advising Qatar on a $1 billion highways project and Interserve that was awarded $100 million worth of contracts to help the Gulf state exploit of its vast natural gas reserves. “We believe that UK companies have a particular responsibility to ensure that their Qatar-based employees, regardless of their nationality, and their sub-contractors' employees enjoy terms and conditions within globally accepted standards of 'decent work' as laid down by organizations such as the International Labor Organization," Mr. Schouwenberg wrote. He charged that workers in Qatar "face quite appalling conditions, are treated little better than slaves and live in unacceptable squalid accommodation". 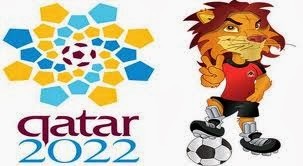 The GMB move is part of a campaign by the International Trade Union Confederation (ITUC) to deprive Qatar of its World Cup hosting rights if it fails to improve working and living conditions and abolish its kafala sponsorship system which makes workers beholden to their employers. British and other foreign contractors targeted by the unions are likely to point to the fact that on paper Qatari rules and regulations guarantee a host of workers’ rights in terms of working and living conditions but not the more politically loaded ones such as the right to form independent unions and bargain collectively. The Qatar 2022 Supreme Committee, which is responsible for organizing the World Cup, as well as Qatar Foundation have this year adopted charters that go beyond Qatari law in recognizing workers’ rights. In practice, Qatar has however lagged in implementing and enforcing its rules and regulations. The Qatar labor ministry admitted as much earlier this month when it pledged to significantly tighten oversight and increase the number of inspectors. Qatar’s efforts to comply with calls for improved material conditions in a bid to resolve the issue and fend off the unions’ more political demands which touch on the viability of a tiny minority of nationals to retain absolute control of a country in which the vast majority of its residents have no rights and are essentially viewed as guest workers are undermined by high profile labor disputes involving international soccer players. In the latest incident, French-Algerian international Zahir Belounis, was advised earlier this month that he could leave Qatar after being banned from travelling for two years because of a dispute with his club, Al Jaish, which is owned by the Qatari military. To leave, however, he would have to sign a statement that would effectively force him to forgo two years of outstanding salary payments. Qatar’s inter-meshed commercial and political interests are also under attack in Egypt where the toppling in July of the elected Qatar-backed Muslim Brotherhood government of President Mohammed Morsi has soured relations between Mr. Morsi’s military backed successors and the Gulf state. The Egyptian Radio and Television Union, which controls state-owned broadcasters, effectively abrogated an agreement under which Al Jazeera, the state-owned Qatari television network, had bought the exclusive rights to African soccer championship matches. “We will not observe the rights of Al Jazeera or abide by any judiciary provisions issued in its favor, since it has not respected the decision of Egyptian judiciary system and continued the activities of Al Jazeera Live Egypt in Egypt. This will not be limited to the Ghana-Egypt game, but will also include any game the Egyptian television wishes to broadcast. No one will be able to stop us,” said the union’s head, Essam al-Amir. Mr. Al-Amir was referring to the banning of Al Jazeera’s local affiliate because of its alleged support for the Brotherhood. Al Jazeera has vowed to sue the union for its broadcasting of a recent African championship match between Egypt and Ghana in violation of the Qatari broadcaster’s rights to the game. Qatar’s troubled relations with Algeria were reflected in a similar dispute after Algerian television broadcast a match of its national team against Burkina Faso in violation of Al Jazeera’s rights. Egypt last month, in a further indication of souring relations, returned to Qatar $2 billion after the two countries failed to agree on terms to convert the Qatari deposit in the Egyptian central bank into a bond. Qatar’s efforts to use sports as a pillar of its soft power and a key building block in its foreign, defense and security policy in the absence of the ability to create the hard power it would need to defend itself are further undermined by perceptions that it is backing jihadist groups in the civil war in Syria. “Qatar, noted for its ‘hyperactive’ foreign policy, is so eager to acquire clients in the region that it has shown little concern for these groups’ intensely Islamist principles,” said Foundation for Defense of Democracies senior fellow David Andrew Weinberg in a recent CNN commentary. On October 15, James Dorsey, a syndicated columnist and author of the blog (and forthcoming book) "The Turbulent World of Middle East Soccer," addressed a Washington Institute Policy Forum. The following is a rapporteur's summary of his remarks. How Much of a Dent? Egyptian military of its favourite toys but does little to weaken its military capability. to its counter-revolutionary allies such as Saudi Arabia. obliged to cut off aid. as a threat to their national security. compensate for any loss of US economic and financial aid. substituting military hardware for what is the world’s 14th largest armed forces. of $4.21 billion in 2012, is hardly in dire need of additional hardware. guarantee hundreds of millions of dollars in business for American defence contractors. effort to escape autocracy and move towards a more liberal society. consequently were often focused on their economic rather than military interests. services and land reclamation projects. dominate the markets for water, olive oil, cement, construction, hotels and gasoline. estimated US$345 million in annual revenues. 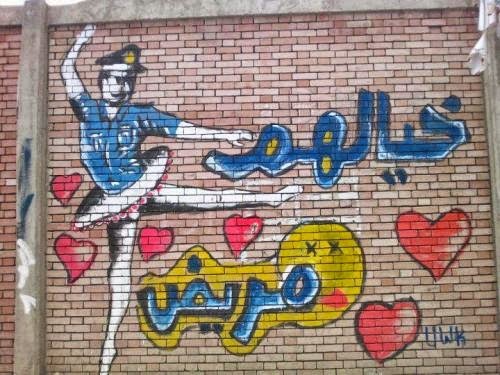 first 18 months after the toppling of President Hosni Mubarak by a popular revolt. Food riots in 2008 prompted military bakeries to distribute bread. General Mahmoud Nasr said last year. shrink its commercially inefficient empire, and endorse privatisation. "It has become manifestly clear that the reason for moving the (tournament) from Basra to Jeddah is political and taken under intense pressure from Saudi. Saudi Arabia and others are conspiring behind closed doors against Iraq and the sports (of Iraq)," the Iraqi youth and sport ministry said. In his weekly television address, Iraqi Prime Minister Nuri A-Maliki charged that the deprival of Iraq of its right to host the Cup was "prejudiced against the rights of the Iraqi people." The AFC said neither it nor FIFA would tolerate government interference. "It's the right of the Iraq Football Association to decide on the interest of their team, fans and other stakeholders. The government should not interfere in the football affairs,” the AFC said, adding that it was asking the government “to stay away in the interest of Iraqi football." 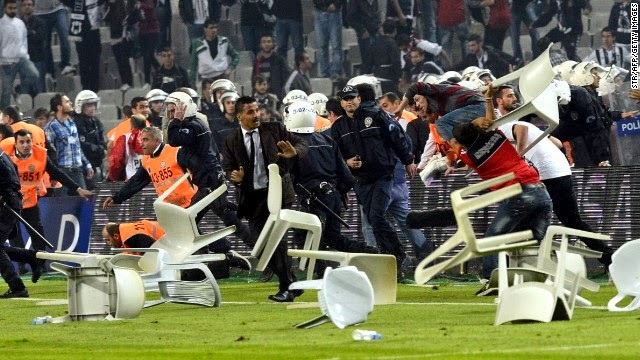 Financially stressed Turkish soccer clubs are becoming pawns in the political struggle between Prime Minister Recep Tayyip Erdogan and militant soccer fans who rank prominently among his detractors as soccer pitches and university campuses emerge as major battlefields between the government and its detractors. Militant Egyptian soccer fans, a key player in Egypt’s almost three year-old political rollercoaster, are fighting a battle for their existence in the shadow of the military’s campaign to repress the Muslim Brotherhood. At the core of the battle is the military’s desire to crack down on one of the country’s largest civic groups and assert control of stadia in advance of a resumption later this month of the country’s suspended premier league. In a statement echoing declarations on the eve of the mass anti-government protests in 2011 that toppled President Hosni Mubarak, the Ultras White Knights (UWK) -- the militant, highly politicized, well organized and street battle hardened supporters of storied Cairo soccer club Al Zamalek SC -- stressed that it was not a political organization irrespective of the political leanings of its members. 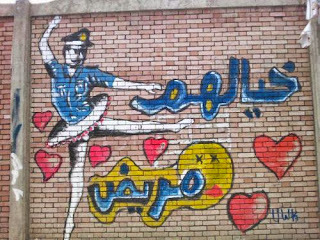 In 2011, UWK alongside its arch rival, Ultras Ahlawy, the fan group of Zamalek competitor Al Ahli SC, stressed its non-political nature but said its members were welcome to participate in the anti-Mubarak protests. UWK’s latest statement on Facebook came as many of its members joined opponents of the armed forces and the military-backed civilian government installed after the July 3 coup against Egypt’s first democratically elected president, Mohammed Morsi, to march on Tahrir Square where Egyptians where celebrating the 40th anniversary of the 1973 war against Israel. That war restored Egyptian military pride following the routing of Egyptian, Syrian and Jordanian forces and Israeli occupation of the Sinai, the Golan Heights, the West Bank and the Gaza Strip in 1967 and laid the basis for the Egyptian and Jordanian peace treaties with the Jewish state. 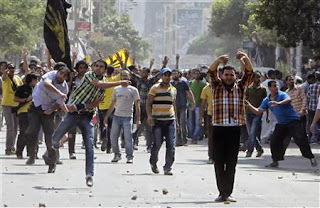 Security forces used tear gas on Sunday to prevent the ultras and anti-government demonstrators from reaching Tahrir. 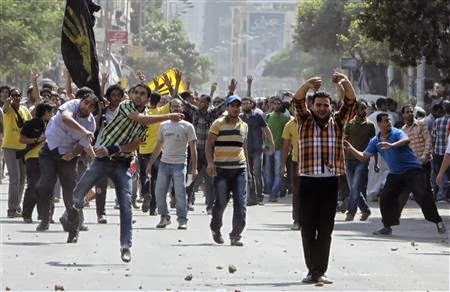 The Egyptian health ministry said at least 28 people were killed and 83 wounded. Some 200 alleged Muslim Brothers were arrested. The association of many UWK members with the Islamist movement indicates the degree to which the club’s fan base has evolved from the first half of the last century when Zamalek was closely aligned with the former British colonial authority, the monarchy that was overthrown in 1952 by Gamal Abdel Nasser, and Egypt’s upper classes. Its rivalry with Al Ahli is rooted in the fact that Ahli was founded in 1907 as the club of the nationalists and republicans. UWK leaders said they had issued the statement to counter efforts to undermine their credibility by identifying them as a group with Mr. Morsi and his Muslim Brotherhood. Their statement came amid a campaign in pro-military and pro-government media asserting that the ultras, who pride themselves on their financial independence, were financially beholden to political interests. The UWK like other Egyptian ultras as well as their counterparts in other parts of the world position themselves as not political despite their ant-authoritarian bent and hostility to law enforcement in a bid to reduce their vulnerability. The group charged that the military and the government were cloaking themselves in the mantle of the 2011 revolution to justify another round of repression. The military has arrested some 2,000 Muslim Brother, including much of the Muslim Brotherhood’s leadership among whom Mr. Morsi, who faces multiple charges and closed down pro-Brotherhood media. At least 1,000 people have been killed since early July in the military’s suppression of the group. The UWK said it was not intimidated by last month’s death of 18-year-old UWK member Amr Hussein who was killed by security forces when the group tried to storm the Zamalek club’s headquarters in support of its demand that club president Mahmoud Abbas resign. “Bloodshed will not deter us,” the UWK said. The group vowed earlier to avenge Mr. Hussein’s death. The ultras’ influence is visible the music and chants the pro-Morsi protesters have adopted in recent weeks. “Nothing has changed, we’re still the terrorists we were before the revolution...we are still demanding what is right and fighting for it, laying down our own lives to fight some ignorant people, for whom suppression is a way of life and whose imagination is sick. Amr Hussein, we restore your rights or die like you,” the group said, in a reference to the Mubarak regime’s attempt to criminalize them. Implicitly the UWK was also referring to the death of 74 Ultras Ahlawy members in a politically loaded brawl in Port Said in February 2012. The brawl was widely seen as an attempt by the security forces and the military which at the time was in government to teach the ultras a lesson not only because of their key role in the toppling of Mr. Mubarak but also their subsequent opposition to the military. “It doesn't matter how hard they hit us. We have been steeled in resisting repression and abuse. We have demonstrated our resolve,” a UWK member said. State-owned Qatari television network Al Jazeera prides itself on hard hitting, let-the chips-fall-where-they fall reporting. Yet, it has systematically avoided in recent days the one story that potentially could affect the very future, shape and security of the wealthy Gulf state: controversy over the timing of the 2022 World Cup and mounting criticism of living and working conditions of up to a million unskilled and semi-skilled workers expected to build infrastructure for the tournament. That controversy could come to a head when the executive committee of world soccer body FIFA meets later this week to discuss the Qatari World Cup. Media reporting on and trade union agitation against often appalling conditions for foreign workers expected to be involved in the construction of tens of billions of dollars of infrastructure related to the tournament in a country in which local nationals constitute at best 15 percent of the total population and six percent of the workforce is likely to force FIFA to go beyond its initial focus: whether to move the competition from summer to winter because of Qatar’s searing summer temperatures that exceed 40 degrees Celsius. Failure to address labor conditions in Qatar, involving both material issues such as a mounting number of work-related deaths, confiscation of passports and lack of access to basic amenities including drinking water as well as the onerous kafala or sponsorship system that makes workers beholden to their employees would open FIFA to allegations that it cares only about the welfare of several hundred players at the expense of hundreds of thousands creating the infrastructure they need. British newspaper The Guardian reported this week that 70 Nepalese laborers had died in work-related incidents in the last 18 months. Other media reports said a further 159 Indian workers had also died since the beginning of this year. Narinra Bad, a representative of the Nepalese community in the Middle East, which accounts for the largest contingent of construction workers in Qatar, said however that only 15 Nepalese nationals had died since the beginning of this year, some of them of natural causes. Qatari officials also insisted that the numbers in media reports were exaggerated. Qatar’s problems were further compounded by an embarrassing salary dispute between French-Algerian international Zahir Belounis and Qatari army club Al Jaish that threatens to ruin the player’s career. Authorities have refused to allow Mr. Belounis to leave the country for some 18 months in line with the kafala system unless he first drops a legal case against the club. FIFA vice president Jim Boyce told Reuters in a telephone interview: “We don't need to rush into this. The World Cup is still nine years away, we have plenty of time. But we also need to look very closely at the conditions of the immigrant workers who are building the infrastructure in Qatar and will be building the stadiums there for the World Cup. I was appalled and upset after last week's stories that dozens of immigrant workers had died as a result of the conditions in Qatar and that thousands of others are being ill-treated. We cannot allow that. These people must be protected and their basic human rights safeguarded." What Qatar had expected to be a celebrated achievement in its projection of soft power when it won the World Cup hosting rights almost three years ago has turned into a public relations fiasco that spotlights existential questions about Qatar’s political and social system, its demographic viability and the sustainability of its national identity. Al Jazeera’s avoidance of the issue spotlights the fact that the fiasco is one of Qatar’s own making. Al Jazeera’s lack of reporting goes far beyond restrictions on media in an autocratic state. It highlights the fact that Qataris remain hesitant to publicly engage their critics in a bid to demonstrate the fact that they take at least some of the criticism seriously and to explain issues that are in many ways unique to the region’s smaller family-run states. Qataris are learning the hard way that their failure to engage amounted to surrender of the battlefield to their opponents and more fundamentally that winning the right to host the World Cup enhanced their prestige but also exposed their warts and gave leverage to activists campaigning for a plethora of rights, including those of workers. The Al Jazeera avoidance of a for Qataris sensitive issue further focuses attention on the problems smaller Gulf states have as they try to get a grip on a world in which technology and social media impose greater openness, public lack of confidence in institutions and leaders has toppled governments and the need to project soft power as part of a nation’s security and defense policy forces them to confront painful and existential issues. First and foremost among these are foreign workers’ rights in a part of the world that traditionally strives to ensure that non-nationals were welcome to fulfill their contracts but would be prevented from gaining a stake in society. In responding to criticism by human rights and labor activists, Qatar has gone beyond issuing lofty statements of principle in a bid to address material concerns and fend off political demands, including abolishment of the kafala system and the granting of the right to form independent trade unions and bargain collectively. To be sure, deflecting political issues is part autocratic reflex. It is however also a function of problems for which there are no easy solutions. Ray Jureidini, a sociologist and migration expert at Beirut’s Lebanese American University, who advised the Qatar Foundation on establishing standards for the full cycle of a foreign worker’s employment in Qatar, including recruitment, deployment, working and living conditions and return to country of origin, notes that abolishing of the kafala system would amount to a significant overhaul of the Qatari economy. “The kafala system exists as part of an effort by Qataris to retain control of their country. Abolishing the system means opening up a labor market in a country where there is no labor market. The requirement for an exit visa is partly the result of Qatar not having extradition treaties with a lot of countries and wanting to prevent those who break the law from simply skipping the country,” Mr. Jureidini says. The Australian-Lebanese scholar concedes that Qatar would do itself a favor by publicly acknowledging the issues it faces rather than by remaining silent projecting the notion of a nation that cruelly implements a system denounced by activists as modern slavery. The same is true of the reluctance by various Qatari institutions to freely discuss the details of steps they have or are taking to improve workers’ conditions including ensuring that workers do not pay for their recruitment – a key issue with vast numbers of laborers indebted for years to corrupt and unethical middlemen who arrange for their employment. To be sure, Qatari’s existential issues do not justify harsh working and living conditions as reported by The Guardian recently. Yet, putting on the table the issues involved in resolving an intolerable situation would put the issue in perspective and allow the Gulf state to work with its critics in finding mutually acceptable solutions. Qatari labor and social affairs minister Abdullah Saleh Al Khulaifi, in a rare instance of self-criticism, implicitly acknowledged that his government had been lax in implementing laws and regulations that human rights activists privately recognize afford workers significant protections. They include a ban on confiscation of workers’ passports after completion of immigration procedures, strict regulation of on-time payment of wages and working hours in periods of extreme heat, and guaranteed access to drinking water and proper healthcare. Mr. Khulaifi said his ministry would increase the number of inspectors checking that companies are compliant with labor laws regarding healthcare, safety, living conditions and salaries; hire more translators to communicate with foreign workers; and establish branch offices in areas where foreign workers live. Qatar has by and large been equally uncommunicative about the fact that criticism of its labor system since it won the World Cup has sparked internal debate. On the one hand, a recent study by the Social and Economic Survey Research Institute of Qatar University concluded that nine out of 10 Qataris favor kafala and that some 30 percent would like to see the system strengthened. Many Qataris, on the other hand, acknowledge privately that their country’s labor system is in desperate need of reform. Kafala, moreover, is disliked not only by employees but also by many employers because it makes them liable for whatever the worker does during and outside of working hours. Qatar like the UAE has taken its first baby steps in nibbling at the edges of an issues that invokes fear of loss of identity and a national existence of one’s own. In a break with the tradition of ensuring that foreigners remain aware of the fact that their presence is temporary and conditional with no prospect of ever having a strong bond to or stake in Qatari society, Qatar Stars League (QSL) earlier this year organized its first ever soccer competition for 16 teams made up of foreign workers. It is looking at creating an annual league for 32 such clubs. A Qatari sociologist went a step further, calling on Qatari sports clubs to open branches in areas where foreign workers live and scouting for talent in the labor community. the right to citizenship, Al Qassemi pointed out that Saudi Arabia, the one country in which local nationals constitute a majority, if only a small one, was the only country in the region to have legalized procedures for naturalization. Mr. Al Qassemi went however a step further noting that the success of the United States was in no small part due to the contribution of immigrants.